Aarhus Unge Tonekunstnere invite artists to create OpenScores. The scores can be video-based, physical / sculptural, or any other format, but must thematise openness. Up to 5 winning works will be selected by an international jury. Acclaimed ensemble Apartment House (UK) will present the winning works at two concerts in Aarhus and Copenhagen in January 2015. In addition, the scores will be exhibited for one week at Kunsthal Aarhus. The musical score describes a situation or sequence of events. Concepts such as graphical notation and the open work have tried to break down traditional musical hierarchies by developing non-specialist notations and non-fixed forms that allow interpreters to take a more active role in the forming of a musical work. With today’s democratisation of technology and information, and powerful software applications such as MaxMSP and Supercollider, the possibilities for exploring open forms are expanded. AUT wish to contribute to the development of this exciting field by inviting composers and artists to create new works that push the boundaries of what the musical score can be. Apartment House was founded by cellist Anton Lukoszevieze in 1995. The collective specialises in the performance of avant-garde and experimental works and has collaborated with such renowned composers as Christian Wolff, Jennifer Walshe and Luc Ferrari, at festivals including Huddersfield Contemporary Music Festival, Ultraschall (Berlin) and Wien Modern. 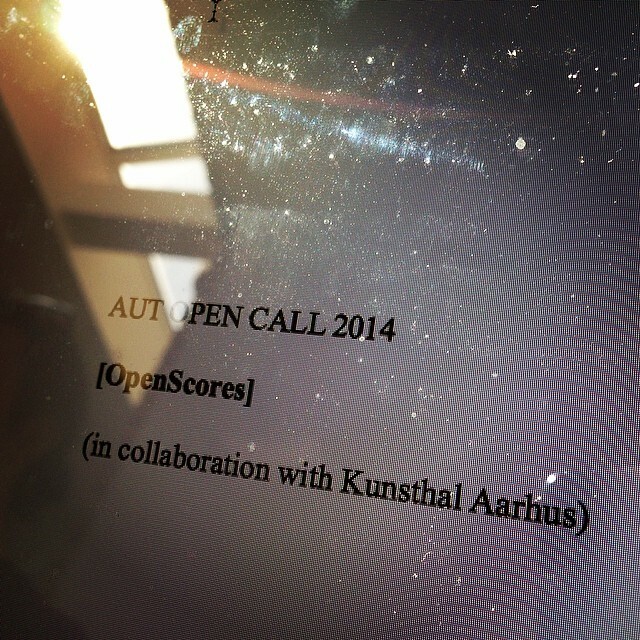 Apartment House will perform as a quartet at AUT‘s Open Call 2014 [OpenScores]. AUT is a not-for-profit organisation for sound arts founded in 1966. AUT‘s Open Call has since 2011 been a platform for trans-disciplinary musical experiments. There has been an increasing interest for the competition, both nationally and internationally. Last year we received submissions from 19 countries. We will only accept original works (i.e. works that have not been performed before). The competition is open to artists of all nationalities and ages. A jury consisting of AUT board members Kaj Duncan David, Allan Gravgaard Madsen and Troels Primdahl will alongside Anton Lukoszevieze (founder of Apartment House) and Joasia Krysa (director of Kunsthal Aarhus), choose up to 5 works to be premiered in Aarhus and Copenhagen in January 2015. AUT will provide housing and cover transportation costs enabling the winning composers to participate in the dress rehearsal and concerts. · 15th of October 2014: Deadline for submission of work proposal. · 1st of November 2014: The selected works will be announced on AUT’s website and Facebook. · 1st of December 2014: Deadline for all performance materials. · January 2015 (dates TBC): Installation of works in Kunsthal, Aarhus; concert at Kunsthal Aarhus; concert at Koncertkirken, Copenhagen.